Where I Got It: The publishers sent me an ARC! Why I Read It: Well...I had requested it, it'd be rude not to read it! I seriously feel as if this book is a boyfriend of mine. The ups and downs I associate with The Trophy Bride's Tale went to a personal level. I attempted it at least seven different times, only reading 10 or so pages each time, before completely ignoring it for about a month. I finally decided to grow a pair and try to slog my way through it and ended up reading the remaining 300 pages in a few hours and LOVING it! I might need relationship counseling after this one. 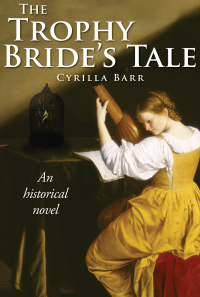 Prudenza is a teenager in sixteenth-century Italy when she is betrothed and married off to a wealthy Florentine silk merchant. Their union is initially a tender, yet awkward, relationship. Over time, things slowly unravel. Shortly after the birth of their first child, Prudenza's husband, Matteo, evolves into a psycho, wife-beating prick. His only use for Prudenza is to show her off as his trophy bride. She finds solace in those around her, yet realizes that all her troubles would vanish if only her husband vanished too. She almost unwillingly 'disposes' of him, only to almost immediately be arrested and then later beheaded. Whew. I usually would have considered the murder of her husband and subsequent arrest and execution as a spoiler, but the forward, or the first five pages, actually takes place at her execution. What are your guys' thoughts on forewords that ultimately give up the end of the story? I thought this one could slide a little bit, as this is based on a true story, but usually these foreshadows are unwelcome in my opinion. This is a book that I'm truly glad I persevered through. The first 100 pages or so are extremely slow; it isn't until Prudenza and Matteo are actually married that the plot picks up and becomes exciting. I'm just going to add that the cover totally wigs me out. Prudenza is described as being extremely beautiful, nothing like the devil possessed woman in the painting. It's a good story, but not perfect; 3.5 stars for being so difficult in the beginning. This seems like a book I would enjoy, but I don't know about those painful first 100 pages! I hate it when I read the introduction to a book and it gives away major spoilers. So I usually skip over introductions now. Good review! Sounds like it was worth the hard beginning. I don't know how I feel about books that give away the end in the foreword. If its in the summary that pisses me off, but if its part of the narrative and done right I don't mind. Sometimes I even forget, then remind myself through thoughts like "But wait, how can it even get so bad as to end up at the beginning"
The first thing that comes to mind is Moulin Rouge (it's a movie but whatever.) my point is it was so good I forgot what was said in the beginning until it was too late. Excellent review! I think I would struggle with this because I get impatient with slow starts. It definitely seems to make up for it though! The book sounds amazing! If I'm reading a book that has a forword that tells you something really bad is going to happen, I'm always hoping that somehow it won't as I get to the events leading directly up to it (even with the beheading of Anne Boleyn, though I know it happened in real life, I always hope she finds a way to escape or something).